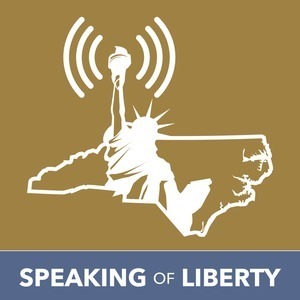 ​Speaking of Liberty is the new podcast brought to you by the Libertarian Party of North Carolina with host Sarah Brady Wagner. We invite you to spend half an hour every-other-week to keep up to date on the issues impacting Liberty in the Old North State. Enjoy interviews with leaders in the Liberty movement, businesses and charities on the cutting edge of innovation, and candidates seeking to earn your trust in elected office. Rep. David Lewis and Sarah Brady Wagner discuss redistricting, electoral reform, cannabis reform, and rural healthcare in an extended interview recorded on March 23, 2018. North Carolina House Representative for District 53, David Lewis, discusses his role in drawing district maps. Micheal Monaco, Libertarian candidate for Court of Appeals in North Carolina sits down to discuss recent legislative changes to the judicial elections and his perspective on the role of Court of Appeals Judge and Sarah discusses the LPNC candidates for 2018.